Like a lot of 1500 owners, I eventually upgraded to an 1800 (mine’s a 2012). While I really like the improved low speed stability and the fuel injection system, I do miss a few things about the 1500. First is the significantly more visible rear lights. One of the next items I miss is the cargo nets I had installed in the saddlebag doors. 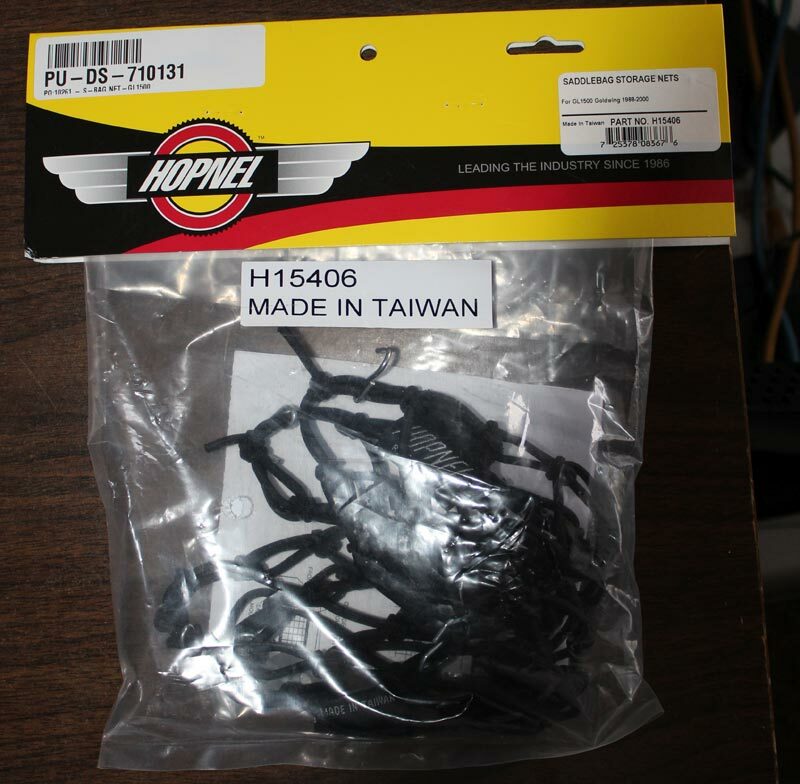 Made by Hopnel and sold by many Gold Wing aftermarket vendors, they were very handy for stashing rain gear and spare gloves while keeping the saddlebag floors clear. I searched regularly for an 1800 version, but I found none, until just recently. A vendor named Parts Giant was selling them on eBay and they listed virtually all GL1800 models as supported. When I examined the photos closely though, I was concerned that they were selling the 1500 version and declaring them suitable for 1800s as well. Since the 1800 saddlebags are quite different from the 1500s, and the 2012 and later 1800s even more different, I was careful to check out the seller’s rating and their return policy before placing my order. Being certain I could return them if they didn’t fit, I placed my order for two complete sets. Knowing how handy they are and also that my brother would have his 2012 1800 here in a few weeks, I was certain he would like a set, too. When they arrived, my suspicions were immediately confirmed. They were in fact the Hopnel GL1500 saddlebag nets. There was no mention of any adaption for 1800s and the included instructions were specific for only the 1500. Before I packed them up and shipped them back though, I studied the saddlebags, mounting hardware and the nets carefully. 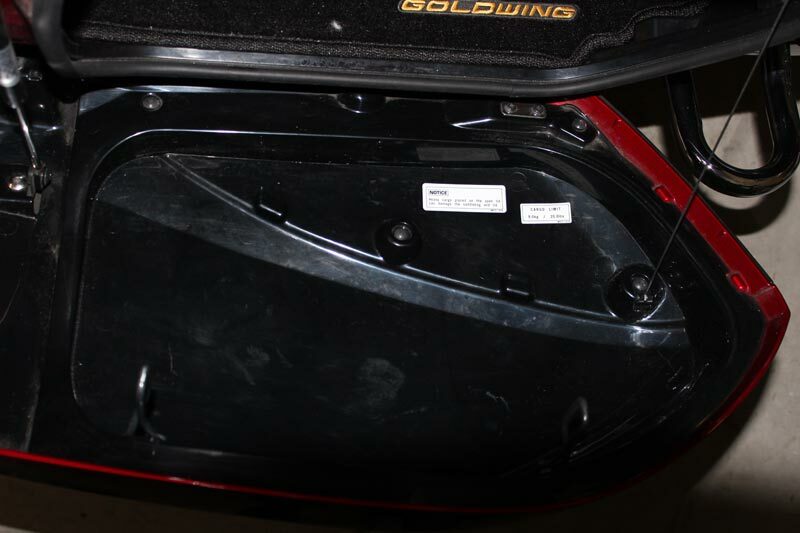 The cavity in the saddlebag door clearly defines the contact area with the bag’s sealing gaskets. The nets would have to be completely inside that area, and the mounts could not impact the gaskets. After a few measurements, I started thinking that they might be adaptable to the 1800 saddlebags. It looked like a few simple changes would make them useable. I opened one package carefully, insuring that I could repackage it and return it if my plans didn’t work out. Because the 1800 saddlebags are shaped differently, the available screws are located in slightly different positions than the 1500. My plan was to mount the net using the screws closest to the 1500 locations. I planned on using the outer screws on the latches and two lower screws (circled in the photo on the previous page, bottom right). The primary concerns were if the net would stretch enough, and insuring that the mounts did not interfere with the door gaskets. 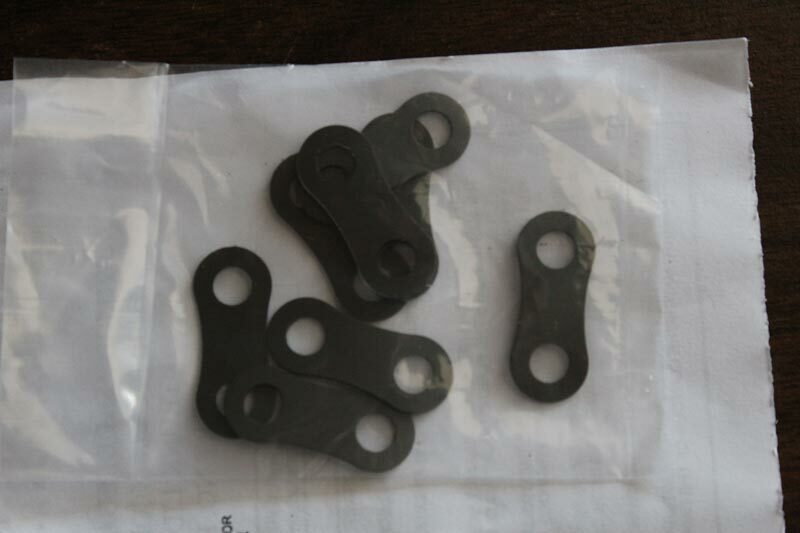 The mounts provided with the nets included nylon mounting tabs, with two holes. These go under the chosen screws and provide a second hole for the “S” hooks attached to the nets. It was clear that if I used them as instructed, the “S” hooks and the nets would be directly in the gasket area and the saddlebags would leak. 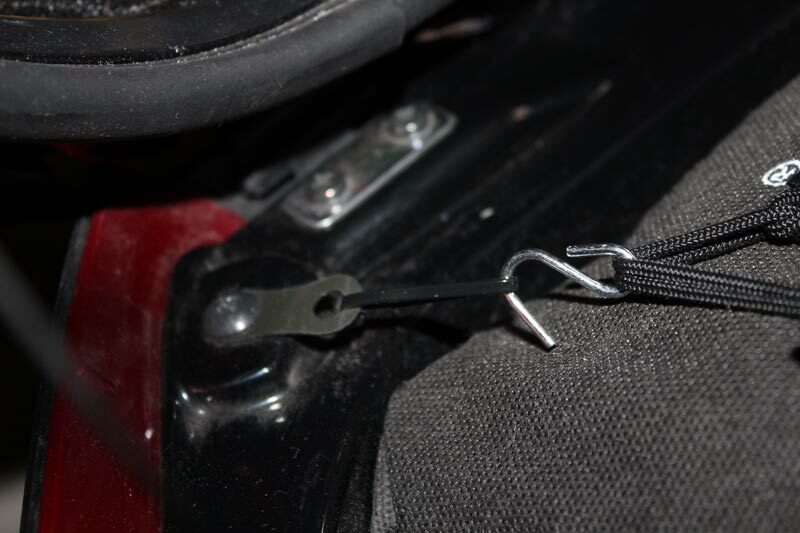 I planned on resolving that issue with the do-it-yourselfer’s best friend, the zip tie. Attaching the mounting tabs to the screws proved to be a challenge. 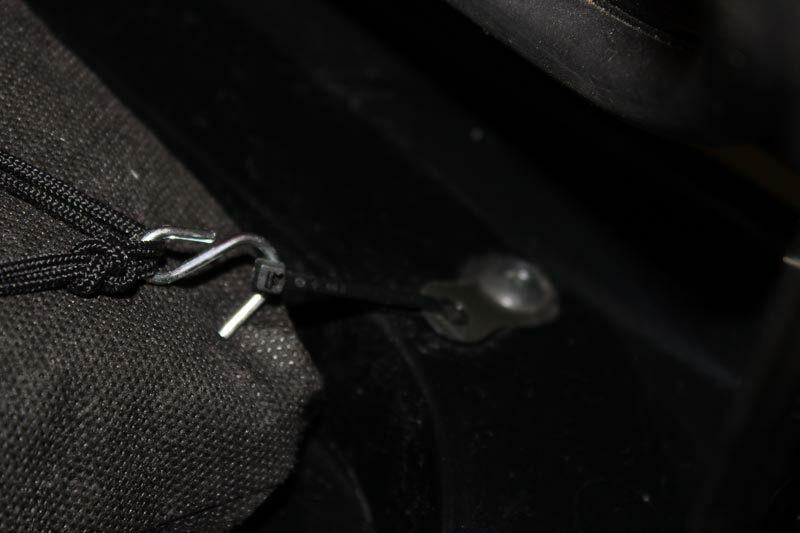 The saddlebag lids swing down and somewhat below the saddlebag body, making the space to access the lower screws extremely limited. Even the shortest screwdriver was way too big to access the screws. There were two possible solutions to accessing the screws: a simple ratcheting angled screwdriver or a seldom-used tool I’ve had for years. 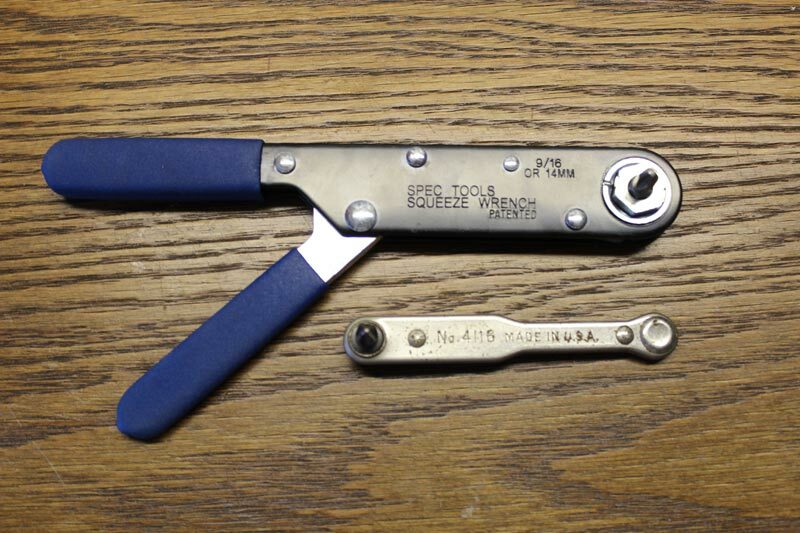 It’s called a Squeeze Wrench, manufactured by Spec Tools. 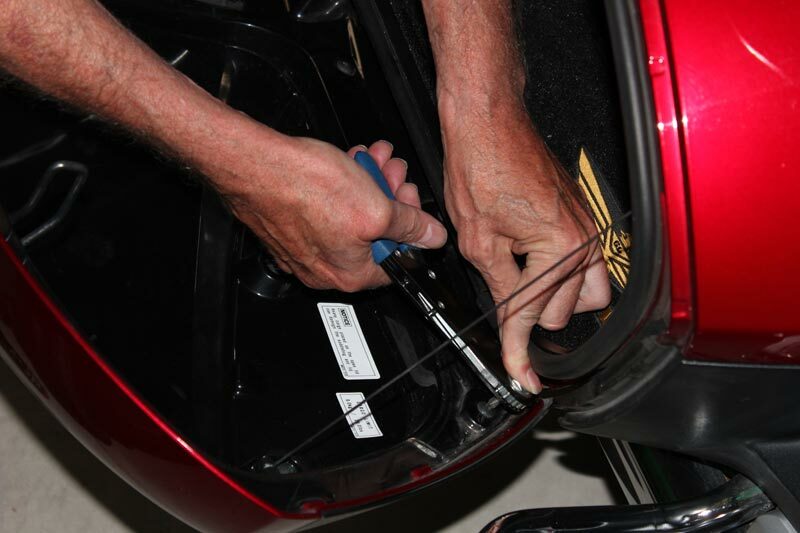 It has sockets for a variety of bolt sizes, plus a fitting that will hold screwdriver tips. Using that, I was able to remove the lower screws, install the mounts and replace the screws. Then I added the zip ties to the lower screws. 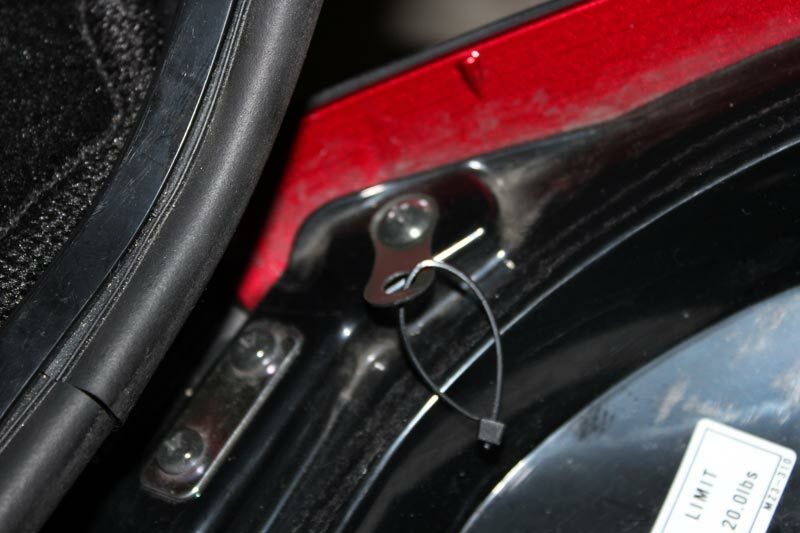 This would allow the “S” hooks to clear the saddlebag gaskets, insuring that the saddlebags should remain water tight. With the nets stretched to the mounts and secured, they were ready to test. I placed two sets of rain gear under them and closed the saddlebags. They snapped shut with only a minor increase in resistance. This I attribute to the thickness of the rain gear coming into contact with the plastic binder slipcase I use to contain all the gear that I carry in that saddlebag (see my articles in the March 2014 Eagles’ Nest or the June 2014 issue of Wing World magazine for details on that). The final result is precisely what I wanted – The rain gear is off the saddlebag floor, stashed securely in the cavity of the saddlebag lid and the saddlebag still closes securely. The net on the other saddlebag will hold spare gloves or a light jacket. While the nets aren’t designed to fit the GL1800, it takes only a little creativity to make them work quite well. *NOTE: George Woodside, GWRRA #116506, is Chapter Director, along with Carol Hannigan, of the Sierra Eagles, NV-E. Woodside has lived in Reno-Sparks since 1990, after 13 years in Southern California. He’s a Level IV Master Rider with close to 50 years in the saddle and 18 years with GWRRA. He has also owned a 1200. Posted 09/10/2015 by wing & filed under Gear, Tech.